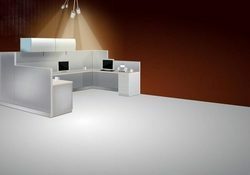 Office Interior Designing Service Service Providers, Contractors, Decorators in India. We are pioneer in completing your entire office interior on turnkey basis as per your requirement and budget. At Fantastic 4 Group we don’t just design offices for today, we optimise space for the future. We undertake complete office interior designing services, which include planning and designing of conference rooms, work spaces, cubicles, open spaces, corridors, etc. We blend uniqueness with style and elegance. Our overview of the office interior designing services. We undertake Turnkey Services for complete interior and furnishing of office premises. We have served clients such as GEOPETROL-a French MNC. spread across an approx. area 1000 Sq. mtr. We have served it with works related to interior, furniture, furnishing, electrical works, communications EPABX, data networking, music and air-conditioning. We have designed more than 150 stores of the Samsonite Group which includes Lipault (Paris), High Sierra, American Tourister, Lavie, Kamiliant, Hartmann. The stores are spread across Middle Eastern countries like Dubai, Abu Dhabi, Muscat, Kenya, Bahrain and others. With the support of our experts, we offer our valuable customers designing services for Office Interior Services. We have accomplished various projects for several commercial structures. Our professionals design the interiors keeping in mind the specific needs of clients.